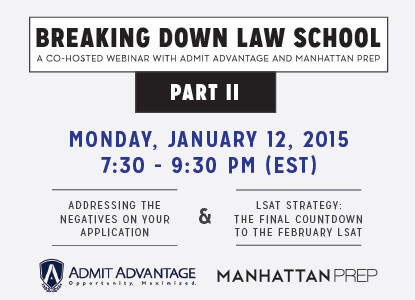 Join Manhattan LSAT and Admit Advantage for the second installment of Breaking Down Law School Admissions, a free online workshop to help you put together a successful application. No application is perfect, but you can take steps to mitigate negatives and emphasize positives. During the first half of this webinar, Admit Advantage’s Director of Law Admissions will review how to deal with real-life negatives on your law school application. Are you also getting ready to sit for the February 2015 LSAT? Veteran Manhattan LSAT instructor and curriculum developer, Matt Sherman, will focus on what kind of prep to do in the last weeks leading up to the test. One of the key points here is to be prepared to adapt to little twists that you didn’t expect. Matt will teach you a hard LSAT game where that’s important. Detailed Q&A to follow. 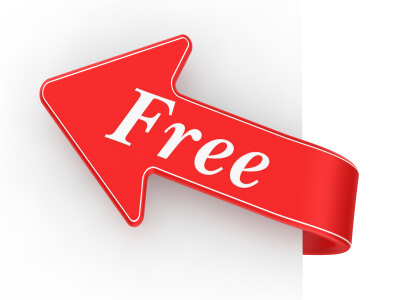 Are You Prepared for Law School Admissions? 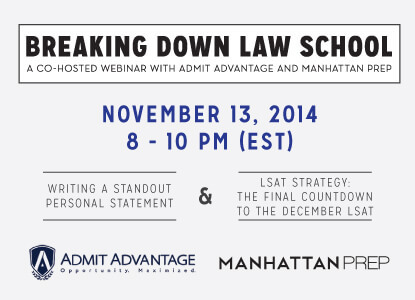 Join Manhattan LSAT and Admit Advantage for a free online workshop to help you put together a successful law school application. This workshop will discuss how right personal statement can make all the difference in your law school applications. Even applicants with great LSAT scores and a high GPA need top-notch personal statements to set them apart from the pack. Admit Advantage’s Director of Law Admissions will teach you how to make the best impression with your personal statement. Are you also getting ready to sit for the December 2014 LSAT? Veteran Manhattan LSAT instructor, Brian Birdwell, will focus on what kind of prep to do in the last weeks leading up to the test. One of the key points here is to be prepared to adapt to little twists that you didn’t expect. Brian will teach you a hard LSAT game where that’s important. Detailed Q&A to follow.